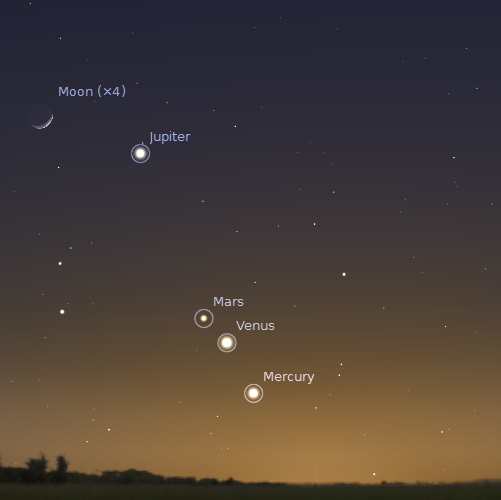 This month we will get to see an incredible moment where Mercury, Venus, Mars, Jupiter, and Saturn – the five planets observable from Earth by simple naked eye – will appear in a line from the horizon to the Moon. The placement of these five earthly neighbors will be noticeable from Wednesday, January 20 to Saturday, February 20. Dr. Tanya Hill, senior supervisor at the Melbourne Planetarium, said that if you don't get to see the alignment this month, you’ll be again get a chance to see it again in August of this year, and then once more in October 2018. Dr. Alan Duffy, working at Swinburne University in Melbourne, also gave some guidance on how best to see this incredible alignment. Since Mercury will appear very much near to the horizon, try to find a nice open spot, well away from tall buildings or trees. Getting as far away from city lights is also suitable, so every planet's luminosity isn't too masked out by light pollution. Venus and Jupiter, though, would be justly easy to spot and Mars’ typical red glow would give itself away. If you can spot one of these planets, just hold up your arm so it’s in line with it and the Moon – the rest should fall vaguely in line with your arm.